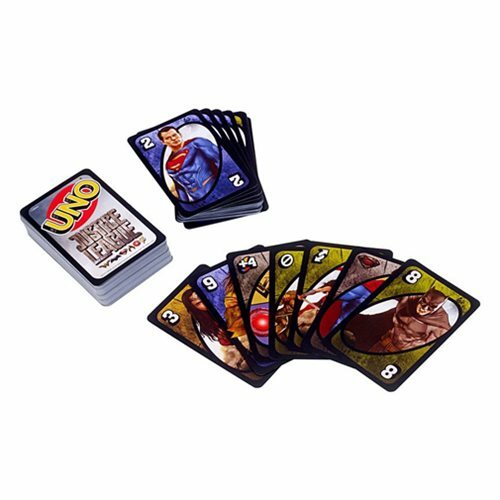 If you're looking for a game that features face-paced Justice League action, this Uno DC Justice League Game is for you! Featuring all your favorite Justice League members such as Batman, Superman, Wonder Woman, and more, this game includes a new wild card: the Superman X-Ray vision card! This unique card allows you to see any other player's cards, giving you game-changing potential. Score points by discarding all the cards in your hand. But, don't forget to yell "Uno!" when you're down to your last card! The first player or team to 500 points wins. This Uno card game pack includes 112 cards plus instructions. Made for 2-10 players and ideal for ages 7 and older.